This week I had the nerve-wracking experience of watching a man climb 60 feet into a tree to limb off branches. Armed only with a machete. He had no safety equipment whatever in fact he was even barefoot. Amilcar, is 35 years old and lives in Puerto Armuelles. 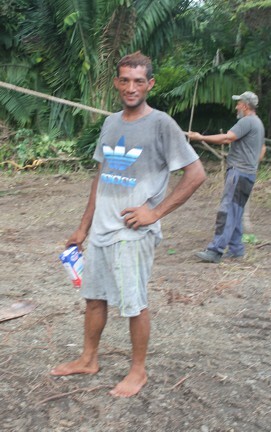 He is part of a long line of barefoot Panamanian daredevils that clamber up trees hacking off branches as they go. The tree that needed cutting down was leaning dangerously toward some high-tension power lines. I offered my safety harness and ropes but they declined the offer, “He would not wear them.” Rain clouds were overhead and there was a distant rumble of thunder. Amilcar halfway up the offending tree. The power lines are about 15 feet to his left. My good friend “Lallo” of the vintage tractor fame, was in charge of the operation so with confidence in his expert abilities I helped where I could. Amilcar, clambered like some scampering monkey higher and higher into the foliage. Then there would be a snap and a pile of branches would come cascading down. The first twenty feet of his climb was with the aid of a ladder. After that he was totally free-form - hugging the tree and hanging onto whatever support he could find – all this while still carrying a machete. Finally, after twenty minutes or so he had cleared most of the higher foliage and again - monkey-like - he descended safely to the ground. 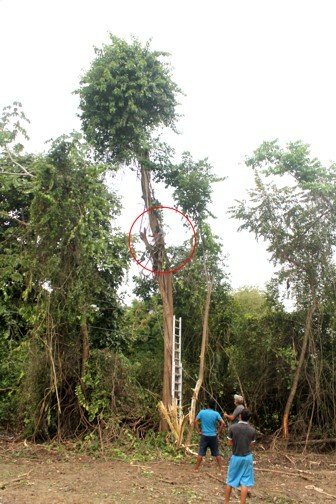 The 50 or 60-foot high tree bent toward the road and leaned dangerously. Lallo had several men tie one line to another tree and had a steel wire tied to the back of my Terrios. 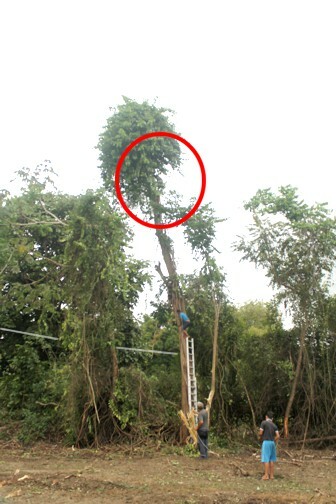 The idea being that with the combined efforts of rope, steel cable and a 4x4 Terrios we could prevent the tree from falling onto the power lines. That frightening scenario could possibly have started a fire – the electricity would have run down the steel cable to my car and I would be toast. The nearby villagers would lose power and no doubt would march as a whole toward me armed with firebrands and pitchforks. In the picture below you can clearly see the curve of the tree and its proximity to the power lines. I was hoping to photograph the fall of the tree but Lallo had me start the Terrios and exert a pull on the line. Lallo had the dangerous job of chainsawing the base. As I slowly pulled on the line Lallo made the final cut and in my rearview mirror I saw the “beast” come crashing to the ground. I remembered in 2009 in Volcan when I saw my first barefoot Spiderman. 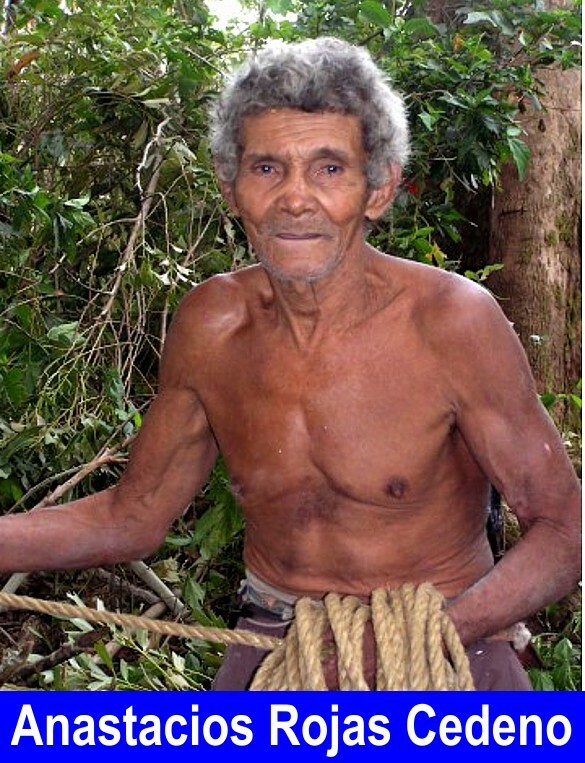 He was just 5-foot tall, weighed about 118 pounds and was still topping off trees at the ripe old age of 73. 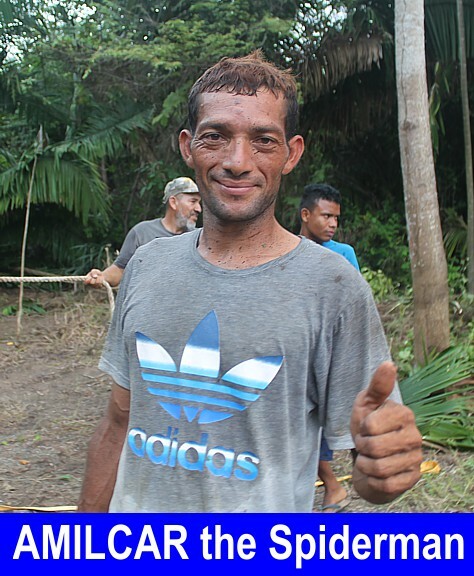 Anastacios Rojas Cedeno also shunned any form of safety gear and harness and yes in the great traditions of the Panamanian Spidermen – he came brave, bold and barefoot. I did ask the silly question, had he ever fallen? Yes it was silly – if you fell from 60 feet you would do that only once. In Puerto Armuelles minutes after the tree had fallen lighting flashed close by. For Amilcar this was just another day and another job. Happily, I can write about the barefoot spider men's’s bravery not their obituary. Ah! Life in Panama – never, never boring. The picture at LEFT is at the San Benito Agricultural school.